JULIA VANARSDALE MILLER is a director, puppeteer, and puppet designer. With Manual Cinema, she has directed Mementos Mori and The End of TV as well as created original roles in Ada/Ava (Ada), Lula del Ray (Lula’s Mother), The Magic City (Helen), and Hansel und Gretel (Hansel). 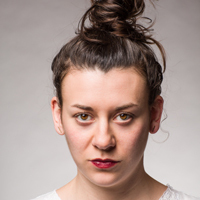 In Chicago, she has worked as a performer and puppeteer with Redmoon Theatre and Blair Thomas and Co. She spent several years training in devised theatre, clown, and mask with Double Edge Theatre, Carlos García Estevez, and at the Academia dell’Arte in Arezzo, Italy. She is a co-producer and director of several episodes of the new web series The Doula is IN. You can find her video and design work at www.thejuliamiller.com.